HYPER- MEDIA? MULTIMEDIA? are they JUST A LOAD OF HYPE or WHAT? You can look at the history of computing as a search for the perfect I/O – put the material from any medium in there, throw it around, process and manipulate it, push it out again. One ultimate day we want to be able to hold intelligent conversations with our machines. In the meantime, they are now quite capable of handling text, graphics, digitised images, and MIDI code inputs with ease. Talking Als are still some way off but technology’s converging to the point where we’ve moved into controlling desktop publishing and video. The next logical extension is Multimedia a whole new world of publishing and presentation. But what do we mean by this term? And why’s it set to take the Nineties by storm? Multimedia is used to denote applications that mix text, graphics, sound and moving video, usually on one format, through controlling hardware that can read, write and drive a diverse range of machinery. CD players, CD-ROM units, Laserdisc devices, videotape recorders, synthesisers, slide projectors – they’re all driveable! Maybe not on the Amiga yet but over in the Mac camp developments are well in hand. Sorry to venture into the territory of the Amiga’s only real opposition, but the Apple Macintosh platform is one of the best barometers of THE THEORY advances in computing and Apple is investing millions in making sure it’s at the core of multimedia. For on the Mac, the future’s already here. At the recent Mac-world Expo in Boston, Apple chairman John Sculley used a Macintosh MX to demonstrate three different live video images running in a word-processing document. He was able to scroll the contents of the document up and down and move its window around the screen. The operation took less than three Megabytes of memory and was an effective demonstration of converging technologies. Applications that bring text, graphics, animation, sound and moving video to personal computers will, as with desktop publishing, bring far-reaching effects. This is not simply a question of greater cost-effectiveness or the emergence of new markets and methods of distribution but more to do with a notion central to multimedia; that of interactivity. For multimedia technology allows a reader, viewer or listener to become a user; able to define, select and alter the material being perused. Whether it’s technical manuals or product databases, museum archives or training materials, glossy advertising or home entertainment, a user can extract exactly what he needs, in any order he wishes and react to the publication as if a dialogue were taking place. The CD-ROM drive is the launch platform for this kind of interactive publishing initiative. CD-ROM disks are the the premier high-density, low-cost storage device; capable of holding over 500 Mbytes of program data: in addition, most also double up as ordinary audio CD players. Mastering and duplication costs are low and drives and interfaces relatively inexpensive. What’s more, the choice of multimedia products currently on offer, ranging from educational and training material to technical documentation and interactive leisure products, retail for as little as $60 in the States. As such, the CD format is an ideal starting point for any machine to extend its interface. Applications are principally text and audio based. Although animation and photographic stills have recently appeared on CD-ROM format, video footage remains rare. You have to look at the more expensive storage technology of Laserdisc to find interactive applications that incorporate moving video. High quality still and moving images can be stored and accessed quickly from the 12″ laserdiscs: typically any one of 55,000 frames can be retrieved in a couple of seconds. But both CD-ROM and Laserdisc players are read-only optical devices which require masters to be pressed by third party suppliers before mass duplication can begin. They are ideal for applications where the user is essentially passive and not invited to make any alteration to the material at hand. True multimedia is more than just consumer-orientated entertainment or education even though this may include interactive encyclopaedias, clip video collections and art tutorials. True multimedia would rely on low-cost, widely available media that can be easily packaged, distributed, consumed and, ideally, customised. We’re talking videotape. Videotape running on recorders that can hook up to your machine via a standard interface code. Through this means, it will be possible to integrate video clips with CD audio, text and graphics and ‘print the outcome to the low-cost, widely available medium of videotape. But in the meantime, the medium term strategy for multimedia lies in support for erasable, high-density storage mediums able to support high-definition television on screen. The key devices here are rewriteable optical disks and Video 8. Both are capable of being written to directly and are able to contain text, graphics, audio and video. How might you go about working with your Amiga in a few years time if you had about fifteen grand’s worth of kit available? You could produce 24-bit colour photographic slides from your software and control a multi-monitor set-up or arc of overhead projectors to view them next to your own custom screens. These screens might include imported still and moving video and CD-quality sound and be organised as sequenced productions edited on your desktop. You will have had the choice of using a multitude of image processors, video and audio digitizers and optical recognition scanners to build up these sequences. You might have included clips of animation, video and audio from the growing bunch of mediabases available and treated them to titling and logos. You will have a software pack age developed by the BBC’s Inter-active TV Unit that enables you to pull in images from Video 8 players, sound and data from CD and CD ROM players, and ‘print’ the assembled results back to video tape. A range of 24-bit graphics cards and colour overlay boards will have also allowed you to combine television quality images with your own graphics and text. You’ll just hit a button on your Amiga and screen recording software will run the whole show for you. If you want to interrupt the automated presentation you just speak into your Voice Navigator and jump to the next cue. And with the proceeds from your first broadcast-spec production you’ll be saving up for your first rewriteable optical disk drive – or maybe you’ll be just paying off the costs of buying all that hardware! All very sci-fi. All very possible right now – if you own a Mac. So why’s Apple ahead and where is the Amiga in the race to catch up? The potential for multimedia applications started with HyperCard on the Mac in late 87 – a multi-purpose program with endless possibilities that set the style of software to come. HyperCard provided an even friendlier interface than the Mac desktop, a busy little ‘home’ card acting as the centre of operations for everything from appointment diaries to spreadsheets to animation. Icons and buttons battled it out for control over a bewildering variety of databases known as ‘stacks’. You could even load in all your favourite applications from within HyperCard and return to base when you’d finished. The potential was enormous – bright, moving graphics side by side with dull, stolid business. 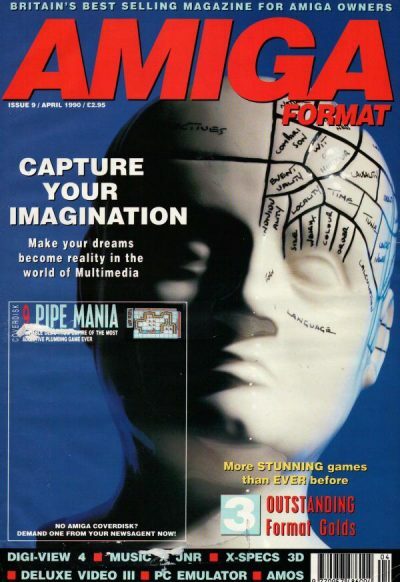 A future Amiga multimedia publishing system would consist of three interconnected elements: control, input and output. Although any Amiga with a hard disk can run multimedia control software like UltraCard, souped-up A2000s will be ideal as they offer more memory and speed. ▼ INPUT Source materials from CD-ROM, CD audio, Laserdisc and rewriteable optical disks will be imported via a common standard based on A-Rexx interfaces and combine with digitized audio from sound samplers and MIDI instruments connected to serial ports and MIDI interfaces. ▼ INPUT Live and recorded video, broadcast television and satellite transmissions will be incorporated into the Control device via a high-quality genlock card which effectively allows video sources to be synchronised with and overlaid on the Amiga’s screen display. ▼ OUTPUT The resultant multimedia material can then be output in toto to monitors, overhead projectors and accompanying stereo sound systems for audio-visual presentation . CONTROL “front-end’ manages the the input of these diverse source materials and controls editing and sequencing tasks. OUTPUT Alternatively, the material can be remain in an UltraCard environment and be output to rewriteable optical disks, videotape and floppy disc or mastered as interactive CD-ROM or Laserdisc. LASER DISC CD ROM A OUTPUT Material could also be broken down into component parts to be generated as transparencies for projection or screen dumps for incorporation in desktop publishing. lack of interfacing standards hasn’t stopped certain companies going out and writing their own custom versions. One such developer is Ariadne Intertactive. Ariadne’s background is well suited to the area of multimedia production since they’ve been supplying software for Rendale and Applied Systems genlocks for years. 1988 saw Ariadne release its Ariadne Amiga Authoring Environment (AAAE), a range of authoring tools for the creation of interactive training and presentation programmes. AAAE is a multi-tasking environment consisting of software tools, devices and independent programmes to interface and integrate the Amiga’s graphics, sound and windows and WIMP capabilities as well as providing peripheral support for touch-screens, laser or tape players, modem links, genlock interfaces and printers. The system is used in Point of Sale and Information and Training applications. The National Physical Laboratory, British Aerospace and the Immigration Office are among the its users, as are GCHQ,( not much chance of us doing a feature on that one!). Ariadne is now working on an upgraded system that will allow multi-player support to interface Amigas to up to nine laser disc and VHS/U-Matic video decks. Using 3 meg 2000s with 68020 cards and 40/60 Meg hard drives, the controlling hardware is ideal for multimedia applications since the multi- tasking capabilities means there are no wait states while commanding external devices to find and load in video sequences. It’s in its multi-tasking that the Amiga’s potential for multimedia lies – Apple and IBM can’t touch it. Moreover, Ariadne go so far as to claim that their interactive Amiga authoring systems allow information providers to get a product up and running for a third of the cost of competing formats. Ariadne are on 01 222 8866. Xebec’s Discover is an interactive information system running on A2000s which can assemble thousands of pages of text, graphics, digitised pictures and sound, animation and video or any combination of these media. Like Ariadne’s system it’s an easy-to-edit authoring environment that allows information providers easy access to customising output as and when it needs upgrading. Authoring is achieved through pull-down menus and requesters allowing series of pages to be built around the modular environment so that differing media data can be easily added. Discover’s mainly being used in tourist situations; museums and leisure parks. One Discover system, based at the Barbican’s Royal Britain Museum, combines photographs, graphics and text in a fifteen-minute programme simultaneously displayed on ten monitors. This pictures and synchronise them with sounds. Thus, material from videodisc, Video 8 and compact disc can be combined with Mac graphics packages to produce standalone sequences which can be ‘printed’ to videotape. To assemble a sequence, source materials are broken down into picture icons or ‘picons’ which can be played and edited to length. Picons are then dragged into the track’ window below the main display which has separate channels for video and audio output. With a minimum of 4 Mbytes of RAM it’s possible to create and view sequences of up to ten minutes duration. To accompany Mediamaker, the Beeb is also producing the Mediabank series of Video 8 tapes: collections of clip video culled from various broadcast programmes. exhibit is completely Amiga generated and runs off hard-disk – replacing the existing laserdisc system. Discover normally utilises either touchscreen or keypad interfaces and includes two monitors – one for authoring, one for display – and either a videodisc player or VTR with Rendale genlock. The system is very low-cost compared to PC or Mac systems, making it ideal for public funded installations like the one at the Manchester Museum of Science which features animated digitised sequences. So, is there any reason why multimedia should be confined to a Macintosh environment? The answer is a qualified no. Although machine architectures and I/O are sufficiently similar to support interfaces for the range of media devices in question, what’s crucial is the operating environment on hand. Top priority must go to the amount of RAM you have on board plus the requisite masses of hard disk space. A ten-second video sequence can eat up 2 megs in no time at all. And then there’s the question of control of all that diverse data through some flexible front-end. The Mac’s always been streets ahead in terms of the way it provides a virtually idiot-proof environment. It’s fast, reliable and, above all, ridiculously easy to run any number of the packages released for it. They all conform to the same menu operations. With the Amiga the situation is less straightforward. But it’s development support that’s the key here – for at the end of the day, the chips in Macs and Amigas are identical – all that’s needed is the will to plot the way ahead. Since the Amiga is well catered for in terms 0″ digitzers, genlocks and sound handling, this will undoubtedly open up the field of multimedia applications for Amiga owners. The machine is already being used for Desk Top Video and interactive training so the groundwork has already been prepared. The Amiga 2000’s open architecture and high RAM capacity make it the ideal contender. So the arrival of UltraCard is great news indeed as it opens up the possibilities for multimedia by providing a common front-end for all future applications. Right: Beyond multimedia and into virtual reality: cyberspace. But if you want to go really sci-fi about the Amiga’s potential then you need look no further than the field of virtual reality and the pioneering work being conducted by AutoDesk and VPL in California where data-gloves and dual micro-monitor headsets transport users into computer-generated virtual worlds. Although these systems use banks of fast 386s and a mini-computer, the interface is by no means arcane. Fibre-optic sensors strung along the inside of the data-gloves relay hand movements and positions as digitial code that updates the stereoscopic images being output through the headset. The idea is to develop virtual environments with which users interact. One VPL simulator has a mini-computer connected upto an exercise bike which you pedal. The headset view creates a street scene in which you’re steadily cycling faster and faster until you reach 200 mph and leave the ground. You’re then able to circle around leaning from side to side to effect turns. Not exactly cyberspace, but on the right lines. Obviously this kind of sim requires realism and that calls for a helluva lot of raw number crunching. Talk of cyberspace realities and the programming and hardware needed to realise them is all the rage at the moment. A new information resource of interest to Amiga owners, The Cyber Times, has recently been set up in London for anyone interested in pushing the boundaries of the possible. It’s Europe’s first news utility for multimedia and beyond and is available on annual subscription for £15 from 90A Devonshire Road, London SE23 3SX. Otherwise, even traditional retail outlets are beginning to venture into the possibilities which are afforded by the Amiga. “We’re five years away from a multi-million dollar multimedia industry – the Cyberspace industry”. So says Cyber Joe Caxton, one of the team based at Track, the well known Amiga mail order and retail firm, talking about the company’s product-in-the-pipeline CyberPad. “It’s a set of tools to allow people to build cyberspace realities – anything from games to sims to remote reconnaissance.” To this end, Track are working on a set of utilities that will allow the Amiga to draw on multimedia material and incorporate it into virtual systems. At the moment a front-end is under development which is based on the concept of an ‘agent’. So is UitraCard not the answer? “UltraCard needs to be scripted: what we want to do is provide a system that doesn’t need any programming whatsoever. Simian will take care of all that”. Joe’s obviously got a lot of work on his hands though. Working with C++ he has to produce a completely interactive computer personality. Not an easy task. So the project will be introduced in stages. First off the blocks is an intelli- gent clip art disk – the” Lifestyles” disk – closely followed by a game, Void Comp. This takes the Blade Runner scenario of having to identify replicants by interrogating characters and the programming is based on the work going into the Simian agent. The object is to identify replicants by asking them anything up to 100 questions and then blow them away. Wrongly ‘retire’ a human and it’s curtains for you. Lastly, Track will release the full Cyberpad utilities after a series of developer’s disks. They wish to attract musicians, programmers and video producers to work with them on defining this form of the future. “People are becoming hardware obsessed”, concludes Joe, “what we need now is an awareness of the ideas behind virtual reality now.” So as with Autodesk, for Cyber Joe “Reality’s not enough anymore”.